If the sight of Jason Momoa’s Aquaman hurtling through the seven seas makes you crave for a water wonderland to recharge in, you are in luck. 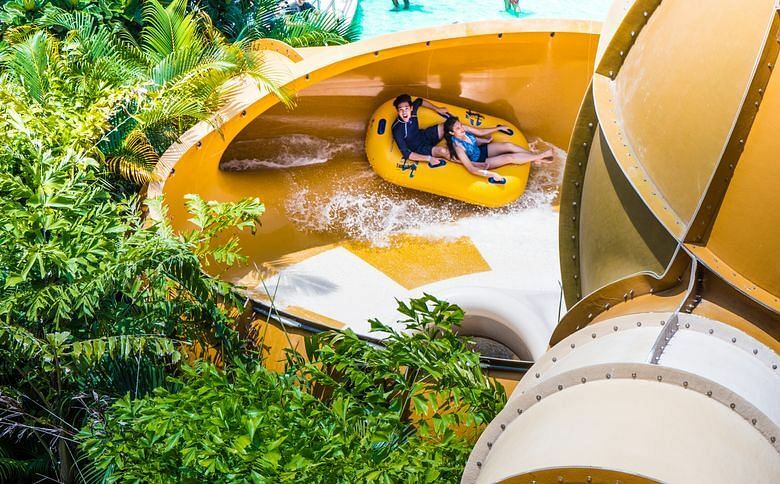 Just 90 minutes by car from Singapore, Johor’s Desaru Coast Adventure Waterpark is one of the biggest waterparks in the world. It features more than 20 rides, slides and attractions, including a gigantic wave pool and the region’s first water coaster. 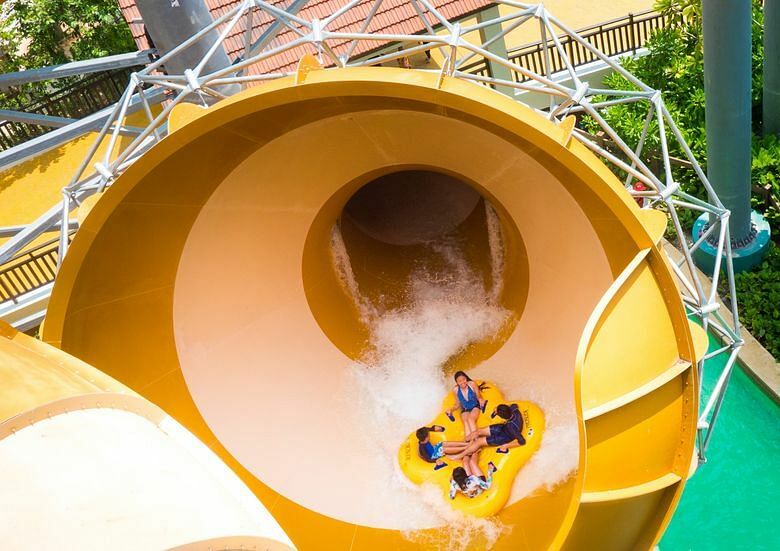 In a nod to Aquaman’s dual origins of land and sea, the waterpark offers a unique mix of wet and dry rides — good news for anyone with a mild case of aquaphobia. If you only have a day to spare, here are our top picks of rides you cannot miss. Once described as "incontestably the largest sea monster in the world", stretching across one and a half miles, the kraken resembled a gigantic squid, sinking ships off Norway with its terrifying branch-like arms. Today, Kraken’s Revenge is perhaps less menacing, but equally heart-thumping. 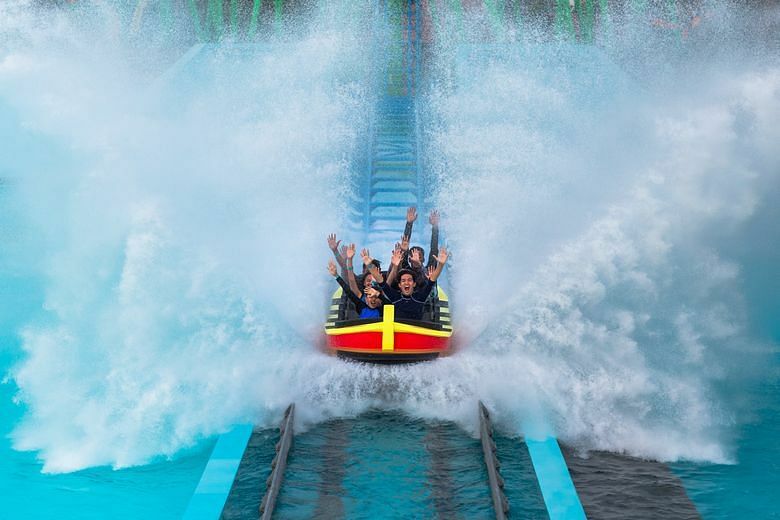 Part water coaster and splashing flume ride, it takes thrill-seekers 30m above the ground in rolling “boats” before swooping and spinning through a full 360-degree horizontal loop. What happens next is a heart-stopping 27m-drop to the shipwrecking kraken waiting below, with speeds approaching 70kph as you plummet to the finish. Survivors of the kraken will be able to catch their breath on a well-deserved leisurely float back to the station. In Shakespeare’s The Tempest, a raging storm created by Prospero, the toppled Duke of Milan, wrecks his enemies’ ship, leaving them stranded on his island. Ah, revenge, you say! In the park’s version of the story, Prospero’s revenge is captured in two high-energy funnels and a sudden 7m-drop that allows for high-banking swings and zero-gravity moments. 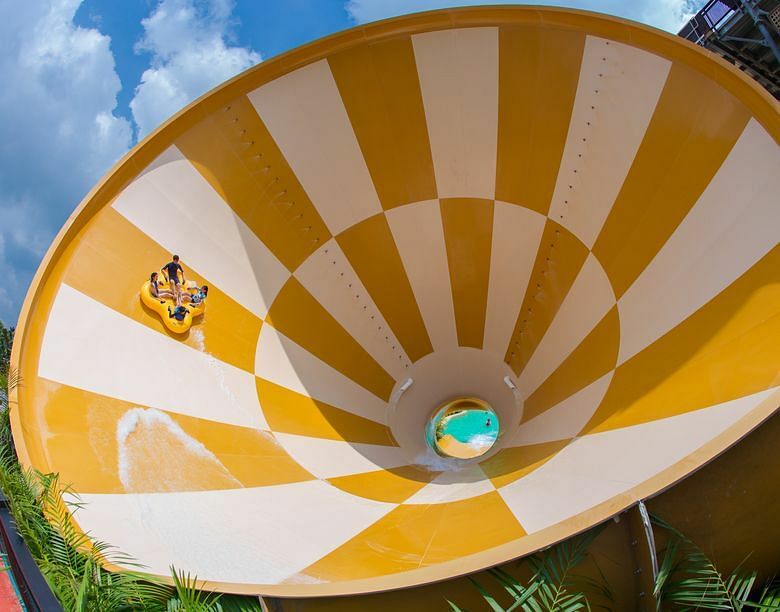 Look out for a 16.7m tube slide with a funnel down the middle that will send you on a swirling vortex before making the dramatic descent to splashdown. With a 170m-long sandy shoreline bordering four million gallons of water, Tidal Wave Beach is one of the biggest wave pools in the world. Kick back and relax at the beachside cabanas, while watching the interesting antics at the wave pool. Take, for example, synchronised jumping. This favourite sport sees parents and children holding hands and jumping in time to the smaller waves, erupting in laughter after. Then train your eyes on the growing swell further out, and you will observe surfers and boogie boarders waiting patiently for that perfect wave, to the tune of 4m-high. If there is anything to be learnt from all this people-watching, is that mastery is never without perseverance. Who: Surfers, boogie boarders, and families up for some fun. Children below 122cm must be accompanied by an adult. There are many ways to relax in the coastal town of Desaru, but Riptide is not one of them. The Riptide will sweep you away at the steepest angles and fastest speeds, making you feel like a weightless feather. Travel downhill to enter the first twister where you will slide back and forth repeatedly, then circle around in the eye of the storm before exiting — and hitting another two twisters. Hang on tight and go with the flow. 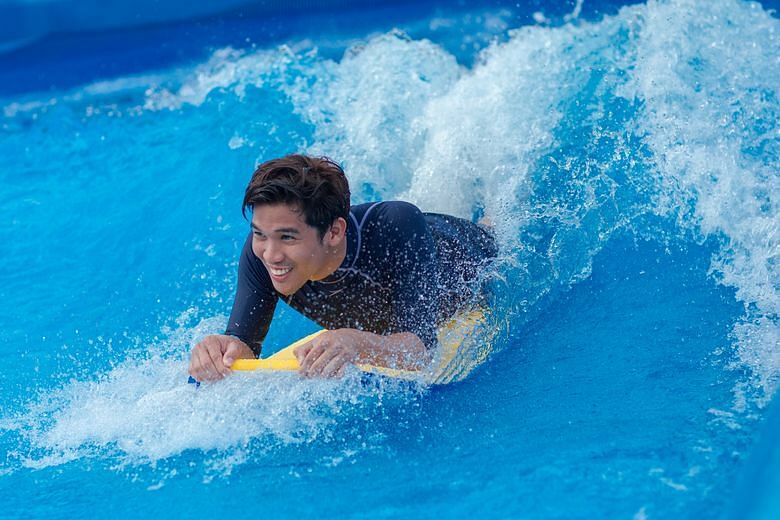 Instead of booking a trip to Bali each time you want to practise catching the waves, how about trying out the Surf Wall? It is a safe, high-energy surf simulator that is loads of fun and closer to home. There is space for five boogie boarders or two stand-up surfers at any time. If your idea of fun involves speed, suspense and a “splash-tacular” time, Wild Whirl offers all of them in spades. Hurtle down a steep entrance channel on your raft, then shoot into the wide-open bowl high on the wall for peak thrills. Speed around the perimeter walls as momentum and centrifugal forces dictate the direction of your life for the next few seconds. As your raft slows down, it will move towards the centre drop chute for a quick exit. Water jets send rafts into the patented CorkScrew and down a tunnel into the splash pool waiting below. Cue: Your waterproof smartwatch reminding you to breathe. 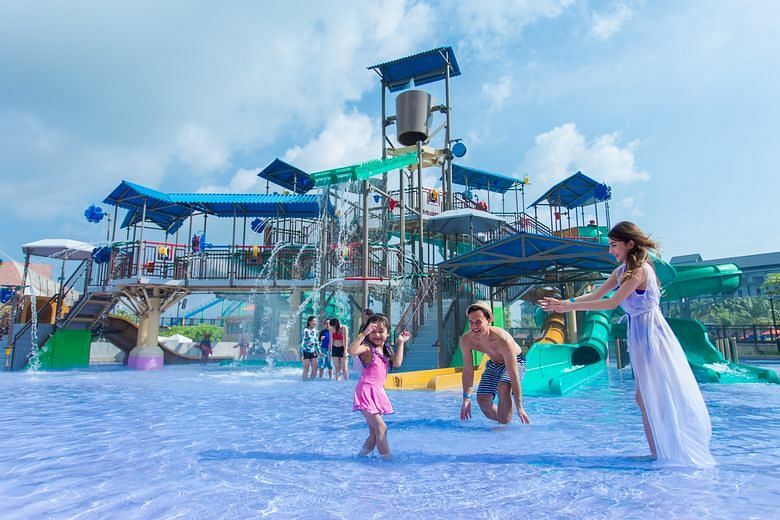 Younger ones have plenty of options at Desaru Coast Adventure Waterpark, and especially so at Kids Ahoy. Here, you can find three play areas filled with water play equipment and 13 water slides designed for various heights, ages and water comfort levels. Toddlers, young children, tweens and early teens will be squealing with fun and laughter as they dash from slide to slide. Who: Families with kids. Children below 122cm must be accompanied by an adult. 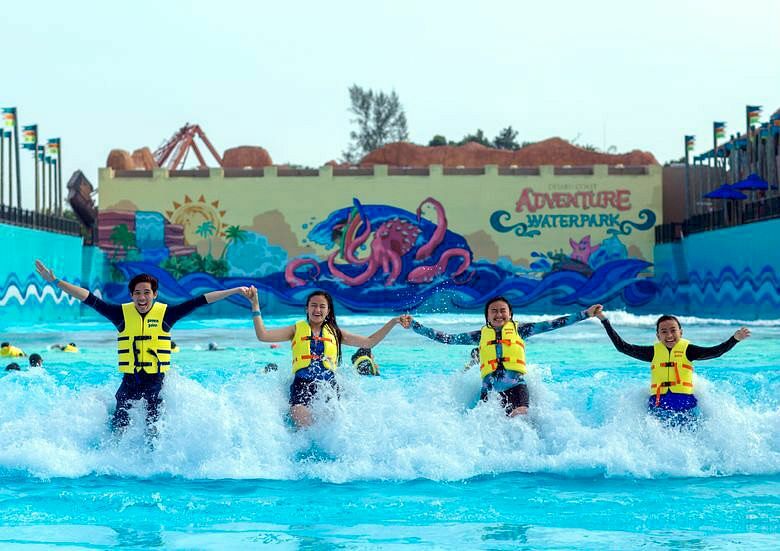 Desaru Coast Adventure Waterpark is easily accessible via land, ferry and air. Drive one hour 30 minutes via the Causeway from Singapore. Opt for coach services by WTS Travel and Tours that departs from the Singapore Flyer. Take a 30-minute ferry ride from Changi Ferry Terminal to Tanjung Belungkor Ferry Terminal, followed by a 30-minute drive to Desaru Coast. Fly to Senai International Airport in Johor, then take a one-hour drive to Desaru Coast. Opening hours are 10am to 6pm daily, including weekends and public holidays. Visit www.dcawp.com to make your booking.